Get to know our team with our Employee Spotlight. This month's featured Briteskies team member is Stefanie Rhine. Favorite Part of the Job: Co-workers and having the opportunity to expand my skillset by taking on new roles and responsibilities. Proudest Moment While Working at Briteskies: Marketing efforts are beginning to pay off, we exceeded revenue goals for this year, and more people are finding us through search. Hobbies and Interests: Reading, hanging out with my friends and family, volunteering in my children’s schools and our community, and traveling. Do you have a hidden talent? I am pretty crafty. Where is your favorite place on Earth? Snuggled on the couch with my husband and kids – best place ever! What was your first concert? Southside Johnny. My most memorable concert was Tom Petty, Bob Dylan, and the Grateful Dead at the Akron Rubber Bowl, and my favorite performer is Bruce Springsteen. I have competed in three triathlons: two as a team with my dad and sister, and one solo. I used to take my younger sister to punk concerts and go slam dancing/stage diving. 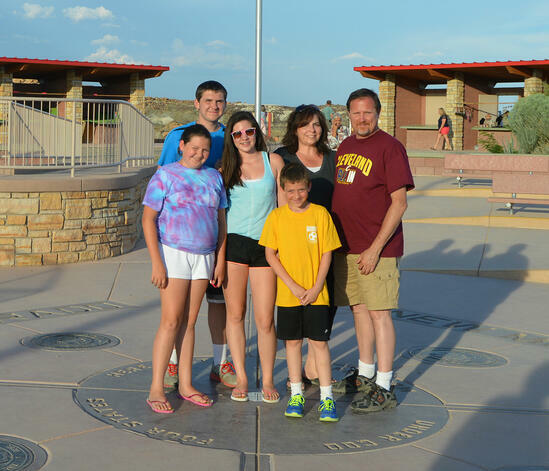 I traveled across the country with my family, including my dad, this summer and it was the best 90 hours I have ever spent in a car. What is the best meal you have ever had? My 40th birthday dinner at Lola.